encourage the use of renewable energy resources. Reduce emissions generated in the neighborhood and improve both outdoor and indoor air quality. Conserve water resources and improve water quality. Enhance social vitality of the neighborhood by encouraging community interaction, partnerships, and outreach programs. Don't heat or cool empty rooms. If there is a room in your home that is unused, close the vents to save on heating and cooling costs. When on vacation, set the thermostat ten degrees cooler in winter and higher in the summer. Do the same if you are gone during the day. Skip the energy-intensive drying cycle on your dishwasher and choose the "air-dry" option, or open the door overnight for zero-energy dish-drying action. Turn off your electronics: Many electronics use electricity even when they're turned off. Plug your TV and accessories into one power strip and switch off the whole strip when not in use. At least five percent of the average household's monthly utility bill goes towards powering devices that are turned off. In fact, a quarter of the energy used in your TV each year is consumed when the TV is off. Was clothes in cold water. Turn the knob on your washing machine to "cold/cold" today, and leave it there. With modern washing machines and detergents, washing your clothes in cold water gets them just as clean as washing in hot water, but it uses half the energy. When you do need hot water - for example, to kill dust mites in bedding - choose cold water for the rinse cycle. Replace your light bulbs. Replace the incandescent light bulbs in your house, even if they haven't burned out, with compact fluorescent light bulbs (CFLs). They last ten times longer and use one-fourth as much energy as incandescent bulbs. You will save $30 or move over its lifetime. LED bulbs are becoming more widely available and last about fifty times longer than an incandescent bulb. The refrigerator is often the biggest energy-using appliance in a home and uses more than 1,300 kWh a year and costs the average American household $120 a year in electricity. You can help your fridge function more efficiently by placing jugs of water in an empty space inside (water retains cold better than air does), and by taking some time once every six months to pull the fridge away from the wall and scrub down the grime that accumulates on the coils. Cut waste through windows. By covering windows with heavy curtains or drapes, you can cut down the heat loss. Awnings on the outside of windows are about 50% more efficient than indoor drapes because they stop the sun before it even hits the glass. Consider installing awnings on south-facing windows, where the sun comes in most intensely (you can retract them in the winter). Look in the National Green Pages for eco-friendly blinds and curtains, such as Earthshade Natural Window Fashions, www.earthshade.com. Install ceiling fans in your most used rooms. By helping the air in your home to circulate, ceiling fans can help make your heating and cooling systems more efficient. www.doityourself.com has step-by-step instructions to help you install a ceiling fan in your home. Get a programmable thermostat. A programmable thermostat allows you to automate your heating and cooling systems. It can be programmed to come on to warm the house shortly before you get up, and to automatically shut off during the hours when you are sleeping or away. It will pay for itself in energy savings within a year. Upgrade your appliances. Any time an old appliance gives out, make sure to replace it with an energy-efficient model. When shopping for appliances, look for the Energy Star logo, which means it is an energy-efficient model and which may make you eligible for a tax break. Appliances account for 20% of home energy use and efficient appliances use ten to fifty percent less energy than standard models. To make sure you're saving energy through your appliances, see "Buying the Best Appliances". 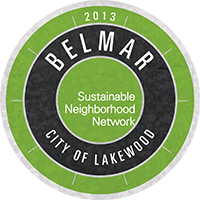 This website and its contents are maintained by the Belmar neighborhood in order to support participation in the City of Lakewood Sustainable Neighborhoods program. This is not an official City of Lakewood website. The City of Lakewood is in no way responsible for content posted on this site. For information on the City of Lakewood Sustainable Neighborhoods Program, please visit their website. © Copyright 2019 Belmar Community Connection. All Rights Reserved.